I began running when I was 23. It started as an escape from the stress and hard work of grad school while living in Ann Arbor, Michigan, and a good way to get my body back into shape after over indulging in craft beer and pizza. I trained for the Detroit Marathon in 2011 and after finishing it I was completely hooked and knew that I wanted to go longer. In 2012, I moved back to Texas in 2012 to marry my wife, Kat. I have fallen in love with the central Texas trails and the trail running community. 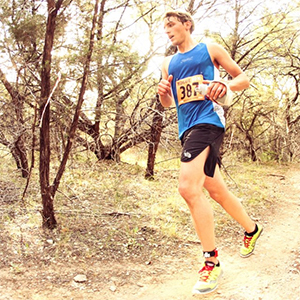 I did my first Ultra in 2013 at the Bandera 50k, and haven’t looked back since. As it is for many others, running is my way of pushing my limits and seeing what is possible. It’s also my way of connecting with the natural world. I love training, racing, being outdoors, and simply hanging out with other runners. The running community in Austin, TX is amazing. I am a native Texan (I’m originally from Houston) and currently live in Austin with my wife and two amazing dogs. I am a professional upright bass player, a music teacher, and a fitness coach. Running has brought balance to my life as a musician and a performer. It keeps me healthy and happy, keeps me present, and has me constantly seeking out and finding inspiration. I want to inspire other musicians to find an exercise practice that they can connect with and make it an integral part of their lives. I discovered VFuel in 2013 and have not used any other gels since. They are so easy on the stomach and the variety of flavors give me enough options to cycle through in a long event so that I never get tired of one flavor. Favorite Beer: Local Austin craft beer. Mostly IPA’s, porters, and stouts. Guilty Pleasure: Fancy cheese and dark chocolate. Other Hobbies: I collect a shot glass from everywhere I travel. Best thing about VFuel: I don’t get tired of the consistency and flavors, even after I’m several hours into an ultra. I like some flavors better than others, but I have yet to get tired of any of them! Favorite running memory: Being in Chateux D’Oex, Switzerland in July 2015 surrounded by mountains. I was the festival coordinator for an improvised music festival. After the final day of the festival I finally had the time to run up to summit a peak overlooking the valley. When I reached the summit and looked out over the valley I felt the greatest sense of freedom I have ever experienced. The sun was low in the sky and you could see snow capped peaks and ridges in every direction as far as the eye could see, with vibrant green pastures and little chalets thousands of feet below me. It was incredible.